Toyota is set to reveal a warm version of its Yaris Hybrid at this year's Paris Motor Show in October. Badged the GR Sport, the small hatch takes highlights from the Yaris GRMN with performance suspension, a black bi-tone roof with rear spoiler and steering wheel from the GT86. 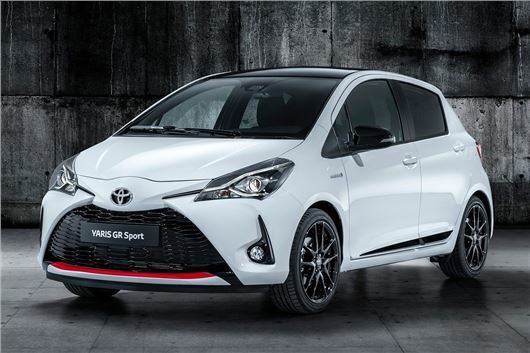 With an 11mm drop in ride height over the standard Yaris, the GR Sport looks the part, helped also by black 17-inch alloy wheels fitted with the same Bridgestone tyres as the GRMN model. As well as the GT86 steering wheel, the GR Sport features GR-branded black suede sports seats with contrast white stitching and white inserts. The gear shift lever is finished in satin chrome trim, while black GR-branded carpet mats are fitted. There's no power upgrade over the standard Yaris Hybrid, meaning the petrol-electric hybrid powertrain will produce 99PS and take 11.8 seconds to reach 62mph. Prices are yet to be confirmed, but expect the GR Sport to sit between the current top spec Yaris Hybrid Bi Tone (£20,150) and the sold-out GRMN (£27,591) when it goes on sale next year.